Psst! 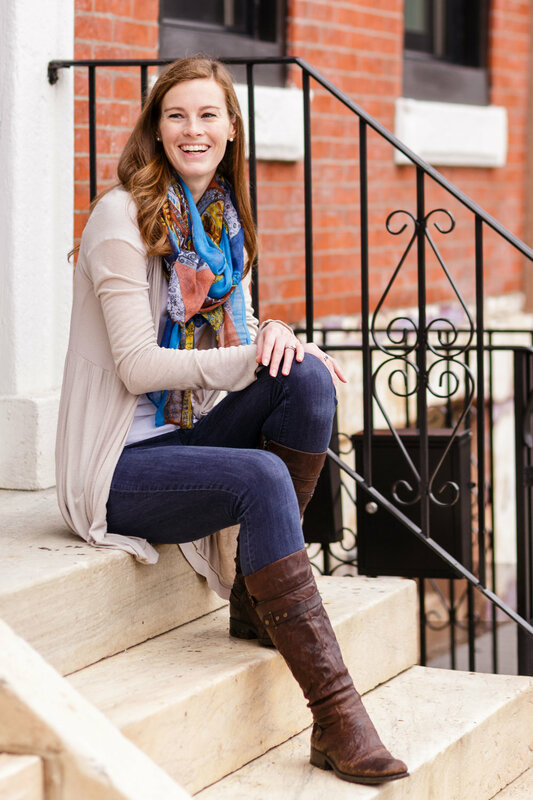 Have you been following along with the new Get the Look series? These posts go up every Friday here on the blog. In them, I take a photo of a beautifully designed space and find the look-a-like pieces you can purchase that will mimic the room's look and feel. Since entryways are usually the first impression that folks get when they step into our homes, why not make it a focal point that's both practical and pretty? Since you only need a few items to create a well thought out space, this can be a relatively inexpensive endeavor. After those are in place, it's all about accessorizing! Add things like books, decorative objects (how cute is the brass elephant in the photo below? ), and art, and you're good to go! I sourced a few items to get you started, but always feel free to add your own personal touch. It's your house after all, and it should reflect YOU! The total cost for this look? About $600. The round brass mirror is one of my favorites - I have one in my home! And that planter has a faux snake plant in it. I've seen it in person and it's actually pretty realistic-looking, so if you're a certified plant-killer, or you just don't want to deal with the real thing, this guy might be a good fit! If you'd rather grab a real plant, this planter is just like the one in the inspiration image, and you can stick whatever you'd like in it. The total cost for this look? About $500. Such a steal! There are a couple of items that are super affordable - one is the abstract art print, which is an instant download from Etsy (talk about getting art in a hurry! ), and the other is the mirror, which is on sale right now for $160. For a 34" mirror, that's a GREAT deal, so snap that baby up! *Affiliate links were used in this post, which means Mix & Match Design Company earns a small commission from your purchase. Thanks for supporting this biz in this way! 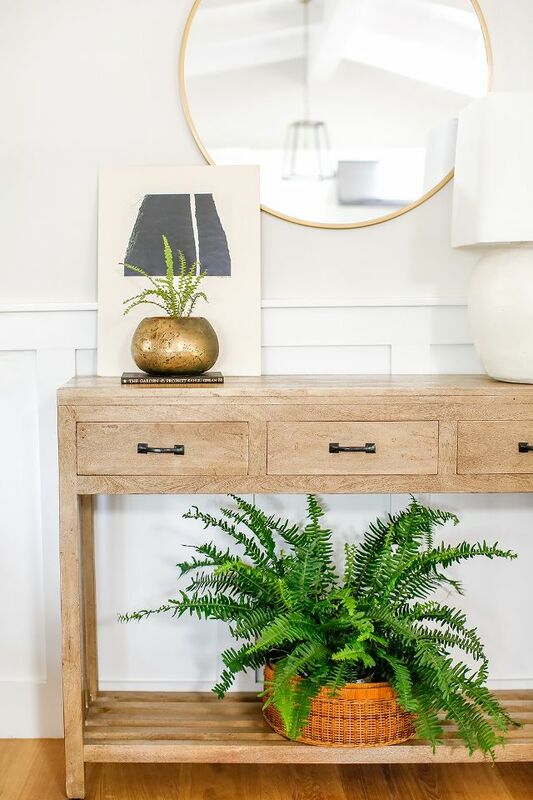 Console tables are a great asset in an entryway for a lot of reasons: they make a great first impression, provide a drop zone for when you come in the door, and create a focal point for that space without taking up a lot of visual real estate because of their openness. That being said, oversized mirrors are really hot right now, and I've gotta say, I love that look. 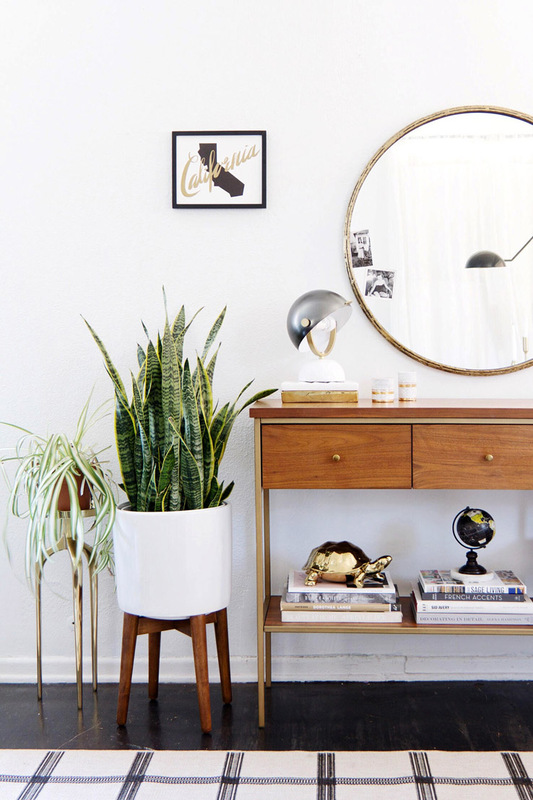 If you go that route though, make sure your console table can handle a giant mirror! In addition to thinking about scale, once you've got your mirror in hand, make sure you hang the mirror at the right height. Most console tables are 30" high (double check that's true of yours! ), and you want the center of the mirror to hang at eye level. Hanging it at that height looks great, and it's practical - you want to actually be able to use the mirror to check your teeth before you head out the door, don't you? :) Average eye level is about 60" from the ground, which you can use as a good a general rule when you're hanging just about anything on the wall if it's above a piece of furniture that's up to 30" high, or if there's nothing under it. But, since the hanging mechanism for a mirror isn't smack dab in the center, you'll need to do a little bit of math to figure out where to place your nail/picture hanger to make sure the center is 60" from the ground. If you've got a round mirror, take the radius of the mirror and subtract the distance from the hanging mechanism to the edge of the mirror, then add 60 to that number. That's where your nail/picture hanger should go. Whew! Enough math for the day! So! 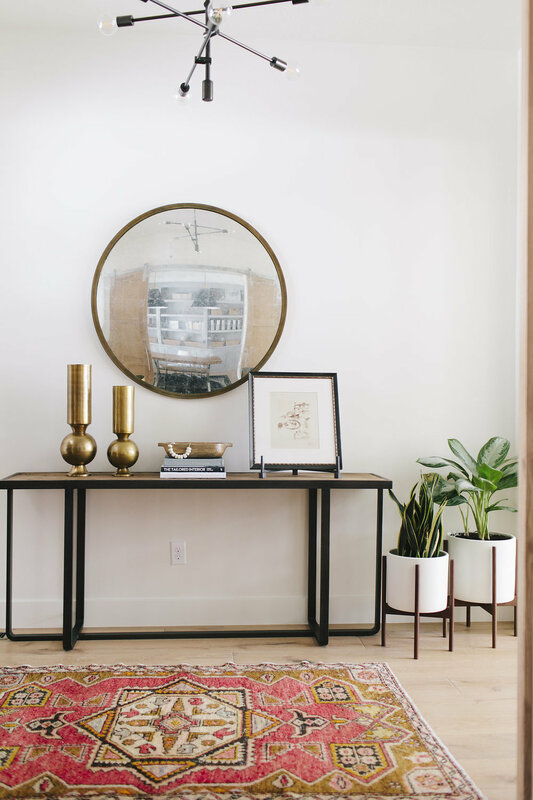 Those are my two cents on the magical pairing of a mirror and console table. If you have questions, feel free to ask away in the comments! Lastly, stay tuned, because I'll be back on Friday showing you how to Get the Look of two of these entryways! Since you only need a few pieces in that space, this is an easy, budget-friendly update that you can easily conquer in an afternoon. It will have a big impact on this little part of your home, and it'll make a great first impression when your guests walk through the door! P.S. Looking for more inspiration? I'm always adding new images to my Pinterest boards - come follow along!